Getting a child's interest is vital to teaching. Perhaps the best aspect of using educational comic books is that children WANT to read them. Simply give children the comic books. Then watch them open them and start to explore - all on their own. It's as easy as that! 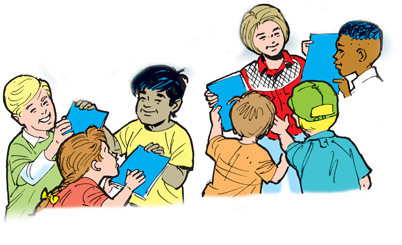 You can distribute educational comic books for independent learning by young people. Children can choose when they will read them – when they are most receptive to the important lessons. You can also use comic books in structured settings like classrooms. They provide a great basic lesson and a starting point for in-depth study or discussion. Children read and re-read comic books at their own pace. 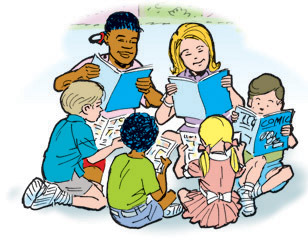 Studies show that children share educational comic books with friends, siblings, and parents. Studies also show they will probably keep the comic book for months and even years, so it can keep on teaching! Give them away at meetings and rallies. Offer them as gifts on special occasions like holidays. Have a stack near the front desk where you work. Over time you can affect many hundreds or thousands of lives. How do you use educational comic books to teach children about American values and ideals? Simply put them in children's hands - the kids will do the rest! Share What's Great About America!